Throughout the month, I have been conducting a series of reviews of our most popular IP PBX’s. I spoke about 3CX, the Windows-based IP PBX software that entered into the arena in 2008 and is quickly growing­. I also mentioned Elastix, which is an Asterisk-based platform that is still purely open-sourced which has been quickly gaining popularity, especially among the budget-conscious crowd. The capstone of my review is Switchvox by Digium. Switchvox, like Elastix, is an Asterisk-based platform which was developed by Four Loop Technologies and perfected by Digium in 2007. Switchvox is a commercial version of Asterisk, so the source code is no longer open. Switchvox offers a polished, clean, and professional packaging of Asterisk amazement. VoIP Supply uses Switchvox as our VoIP phone system, so it is the phone system closest to our hearts. It is most often sold as an appliance with the IP PBX software pre-installed although you can purchase the Switchvox SMB software as a standalone and install on your own hardware. Switchvox appliances are offered in three flavors, the Switchvox 65 which will support up to 30 users, the Switchvox 305 which is ideal for up to 150 users, and the Switchvox 355 which will support up to 400 users. Beyond 400 users, you may need to look at multiple appliances or possibly an Enteprise solution. Each Switchvox appliance can be customized for PSTN access when necessary by installing Digium analog or Digium digital telephony cards. If you prefer to keep the transcoding load off your IP PBX appliance, you can also use Switchvox in conjunction with a Digium T1 gateway. Technically, you can use Switchvox with any VoIP gateway, but when possible, we recommend using an end-to-end solution to simplify technical support when it is needed (I talk more about this later). Switchvox offers the usual suspects such as caller id, call waiting, 3 way conference, and HD Voice (G.722 codec) along with management functions like Auto Attendant, Call recording, and web-based management. Just like Elastix and 3CX, Switchvox easily supports integration with third party applications and APIs. It also supports remote extensions seamlessly which is a must-have in today’s business environment where telecommuting and remote offices are the norm. Switchvox is a proprietary solution but unlike other well know proprietary phone systems like Shoretel, Avaya, and Cisco, it will work with most SIP-based IP phones. Switchvox can be self-provisioning with Polycom phones and snom phones by purchasing a Polycom Feature Pack or Snom feature pack, also referred to as ‘provisioning tokens’. 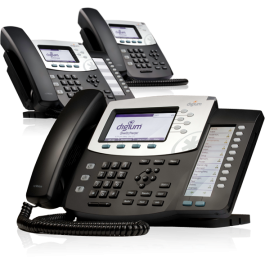 Out of the box, Switchvox is self-provisioning with Digium phones. As a matter of fact, when you plug a Digium phone into a network running Switchvox, the phone will auto-discover, find the user profile, and be ready to work! As a user of Switchvox for 3 years now, the strongest selling point from the user perspective is the Switchboard. 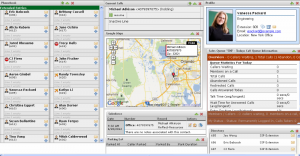 Switchvox Switchboard offers a desktop GUI of the phone architecture for each and every user. Desktop users can see a company directory of everyone on the system including presence. Drag and drop calls to other phone users to transfer or park calls in the parking lot. Included in the Switchboard is the ability to Instant Message other users. Similiar to the Elastix platform, Switchvox is a total UC platform. It incorporates a VoIP phone system, instant messaging, and fax server. Switchvox also has the ability to communicate between SIP-based video endpoints, allowing point to point video conferencing without expensive dedicated video conferencing infrastructure. If you need advanced features such as multipoint video calling or embedded data included into your video, you will need to upgrade to a full featured video conferencing platform such as Lifesize or Cisco Telepresence. I mentioned above that Switchvox will integrate with third party apps, and more common apps such as CRM or Salesforce.com are already integrated into the system. When you take advantage of this feature, the capabilities of the Switchboard expand even more to allow customer records to automatically appear when a number associated with their account calls in. Google maps allow you to physically place your caller’s geographical region to best service them. One of the great features of Switchvox that you don’t see in some less established IP PBX’s is the voicemail to email feature. How often are desk workers working in the office but away from their desk and not realize they have received a call. With the voicemail to email feature, they will receive an email notification of the received voicemail along with the phone number and sometimes contact details of the caller (if available). Speaking of mobile users, Switchvox offers a Switchvox Mobile app so users can make and receive calls from anywhere as if they were right at their desk. With advanced features such as Converged Phones, you can set all your phones to work with your main Switchvox extension. How many phones do you need, right? How about your desk phone, your cell phone, your home phone, your softphone, etc… up to 6 phones! This is a great value add to you and your customers alike… how many times have you had to track someone down, call office, then call mobile, then call Skype… hello???? Where are you???? If your contact was using Switchvox converged phones, you can reach him anywhere using 1 number. Talk about increasing your customer’s experience! Switchvox has all the features that you would want and need in an IP PBX. Because the product has been on the market for at least 5 years with a team of paid professionals constantly writing updates and working on the packaging, it is a polished system that is extremely user friendly. There is a large, paid staff of support personnel who are on the phones 24×7 to help you install, administer, or use the system. Switchvox is an accomplished brand name which made the Frost and Sullivan best value in Unified Communication last year for SMBs. According to Frost and Sullivan, Switchvox delivers value by “demonstrating excellence by creating value for customers with a focus on improving the return on investment that customers make in the service or products.” Switchvox offers a package of voice and video communication capabilities that rivals much more expensive alternatives such as Cisco, Avaya, and Shoretel. Unlike these competitors, Switchvox offers the flexibility of being able to use the system on your existing LAN infrastructure and your choice of SIP phones. Switchvox offers cold spares and redundancy options. Each Switchvox appliance offers a cold spare option. In the event that the hardware ever fails, have a backup on hand. With Switchvox’s backup option, you can have a recent version of your IP PBX at hand ready to transfer over to your cold spare. To save money on somewhat expensive telephony interface cards for both your primary Switchvox server and your cold spare, use a Digium gateway for PSTN access. This way, if your primary server fails, you can redirect the cold spare through your gateway and not have to install a telephony card into your cold spare to connect it. Switchvox offers a multitude of support and help options. Each server ships with 1 year hardware and software warranty and updates. When you license your users, you receive Switchvox Silver, Switchvox Gold, or Switchvox Platinum user subscriptions which cover email only, email & phone 8×5, or email & phone 24×7 technical support. When you purchase a Switchvox system, you are completely covered… hardware, software updates, and technical support. When used with Digium phones, Switchvox can be an end-to-end solution. A Digium IP PBX and Digium phones means one support number to call when things don’t work right. This can be a huge time saver when trying to determine where the point of failure lies because you eliminate a lot of the manufacturer finger pointing… although they will likely say it is your SIP provider…. (Tech Support rule #1 – Always pick on the guy who’s not on the phone!) In addition to being easier if you ever need technical support, which is unlikely since the system is so easy to use, it just makes sense. SIP phone manufacturers who build non-proprietary phones build them to meet the needs of all IP PBX’s. When you install a Grandstream phone or a Yealink phone on a PBX there are going to be buttons that don’t do anything or features that you need to program into the phone, such as hitting **899 to park a call, for example. 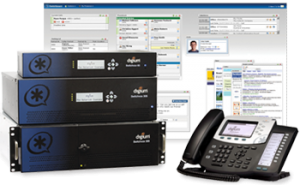 When you choose a Digium phone for a Switchvox deployment, the phone is built for this system. All the buttons on the phone match up with features and actions in the Switchboard. To have all the features of the system at the users disposal, choose a phone that is meant to do just that like Switchvox and Digium phones. Switchvox functionality is outstanding and thorough. Their support is first class and the quality of their materials is second to none. However, ordering and maintaining all these things can be quite confusing and cumbersome. First, unlike Elastix, you pay for users. With 3CX, you pay for concurrent call. With Switchvox you pay per extension which is likely going to be more than concurrent calls. You must pay for analog devices running through the PBX as well, such as fax machines and modems. This means you need to have your network assessment done and ready when you buy your phone system and you will likely have to come back to buy more user licenses if your company is growing. Get to be friends with your VoIP Reseller… I know of one who would love to be your friend! Secondly, if you wish to continue receiving technical support from Digium, those users must be renewed annually. Switchvox support renewals are a recurrent cost. I mentioned above that Digium offers technical support, software upgrades, and hardware warranty. Each of these is a renewable license that must be reordered year after year. So if you are keeping track here, that means every year you need to buy a user license renewal (1 per extension), a software maintenance renewal, and a hardware warranty renewal. You can save yourself administrative work by purchasing extended warranties and renewals for the first 5 years upfront, but they still need to be purchased.With the exception of the hardware warranty, these renewals are tied to each other, so if you want to just get software maintenance renewal, you HAVE to renew your user licenses as well. Renewing your maintenance contracts in most cases won’t break the bank, though. A single Silver user renewal is only $10 a year, the software upgrade maintenance is $500 a year, and the hardware warranty is about $100 a year (depending on appliance model). This can be very confusing and sometimes costly, but luckily, you don’t need to remember. Just call VoIP Supply with your Switchvox registration code and we can manage your subscriptions for you. Lastly, Switchvox costs more than 3CX or Elastix. However, you truly get what you pay for. Elastix, which is most similar to Switchvox since they are both based on Asterisk, is a hardware and open source software solution. Like Switchvox, support is paid. You receive support from an open source experts group. The support infrastructure that Digium has built over the years isn’t there. 3CX is less expensive than Switchvox, but remember, 3CX is a software only solution. You need to have the hardware to run it on and if you don’t already have a server with open space, you need to go buy one. This can easily add $1000 or more to your configuration. Support can be a challenge with 3CX as well. Remember 3CX is software-based, so you need to go to one place for software support. If your issue is caused by hardware, you need to go to a different manufacturer’s support desk. So keep these things in mind when choosing a new IP PBX. Switchvox is feature-rich and manufactured by the makers of Asterisk. These guys know what they are doing! You will not get fired for installing a Switchvox system… it has just as many cost saving/money making features as a Cisco, Avaya, or Shoretel system at half the cost. However, be prepared to have a tracking system in place to maintain your subscriptions, there may be many of them. And Switchvox releases exciting new updates to their system at least once a year, you don’t want to be without software maintenance when the big one that is going to save you so much money comes out… When you decide to buy and deploy your Switchvox UC System, partner with a VoIP reseller who knows what they are doing. They can help you keep track of all these renewals so your deployment is seamless and fruitful!